Doctors across Canada do important work – vital work. They treat society’s sick, injured and helpless under some of the most stressful and taxing conditions. 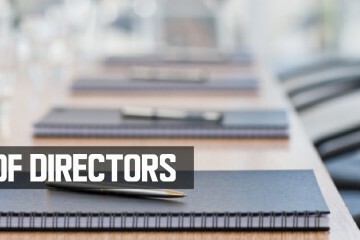 They should be respected and appreciated … as doctors. What this doesn’t make them, is policy experts on contentious issues outside their area of expertise. 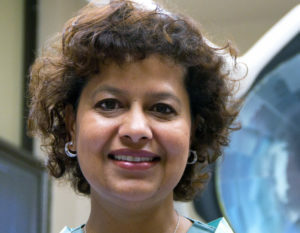 Recently, a University of Toronto surgeon and Professor, Najma Ahmed took up moonlighting as a social justice warrior, creating a website and social media campaign targeting legal gun owners. 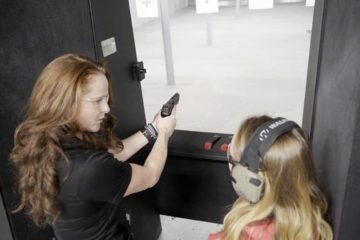 You read that right – not targeting the increasing gang violence we are witnessing across the nation, not focusing on the violent criminal element. 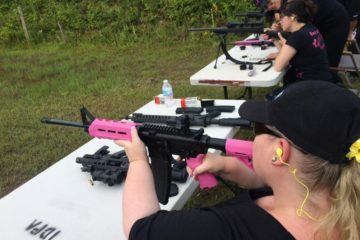 No, Dr. Ahmed is content to isolate Canadian gun owners in her national attack on literally MILLIONS of law abiding sport shooters, hunters and collectors – the very people not responsible for the violence and carnage in the streets of her city. You would think someone this educated, with a background in the sciences would be more of a critical thinker. The evidence is not clear, Doctor, in fact, the evidence says that legal gun owners do not pose a disproportionate risk to public safety and gun control measures have not proven to have any positive effect on homicide rates. But hey, when you are deep in the throws of your new-found celebrity status, why let facts and science get in the way. 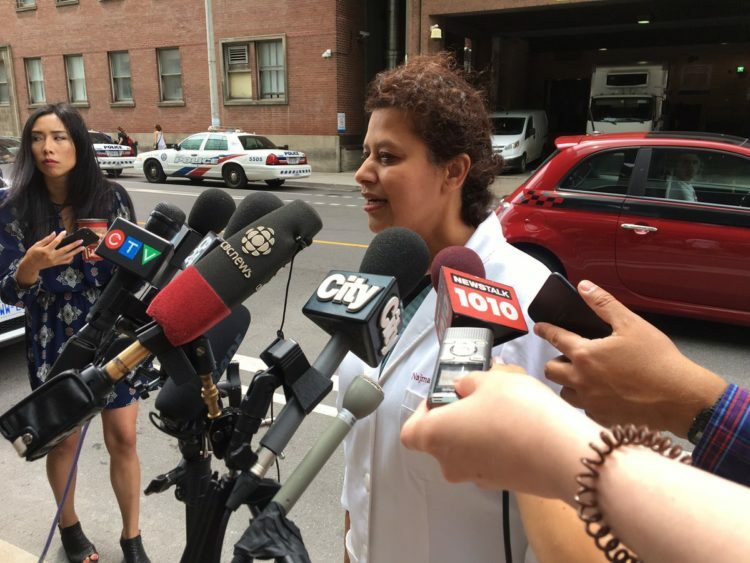 In this University of Toronto editorial by Dr. Ahmed, she details how treating the victims of the Danforth shooting (a crime committed by an unlicensed, alleged terrorist with an illegal firearm) made her an advocate for gun control. It’s amazing how many people can take a senseless act of violence committed by a criminal, and make it about them. She’s done multiple media pieces on her experience dealing with the aftermath of this very violent crime, committed by an unlicensed criminal with illegal guns, including a highlight on the CBC’s The Current – One Bullet series. While her work that day most definitely saved lives, it is almost unconscionable to think she believes more gun control would have made any difference to the madman who already completely ignored all existing firearms regulation. I’ll say it – I admire the Doctor for her work, and her amazing skills that day, working on the victims of this tragedy. But to go further, and politicize this horrific, criminal event is verging on narcissism. She was a hero in my eyes – right up until the point she used those letters after her name to push a political agenda on a topic she clearly knows little about. It is not only disingenuous, it is detracting from the credible work we need to demand on crime, gang violence, mental health and terrorism. 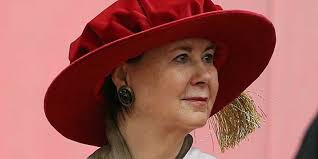 The “good doctor” has created herself an entire array of social media platforms with which to propagate her personal anti-gun stances, and has added credence to them by naming medical associations across the country she says support her views. 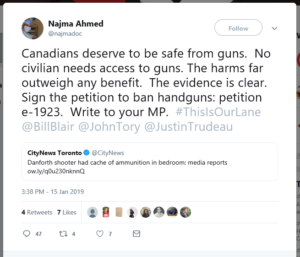 Najma dismisses clear and substantiated facts presented after the shooting – the part about the shooter being an unlicensed criminal with illegal guns – and launches such a hostile and judgemental campaign on Canada’s most vetted, safest citizens. This is mind blowing. 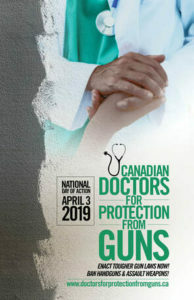 On her website, as terribly done as it is, she has a “national day of action” planned for April 3, 2019 calling for “stronger gun control laws, including passage of Bill C-71 and a handgun assault weapons ban”. Yes I know – she didn’t even get that terminology right. Don’t shame her to hard for it. It isn’t her area of expertise. I might add that medical malpractice is the 3rd leading cause of death in Canada, right up there with Cancer and heart disease. It seems highly hypocritical to condemn millions of good Canadians within our community, when the medical profession kills the equivalent of a full city bus of people, every single day in this country. Hopefully with enough encouragement, Dr. Ahmed will concentrate on her vital and valuable skill set – being a doctor and leave firearm policy up to the people with expertise in that area. You can not target millions of Canadians who have done nothing wrong, while clutching your pearls and claiming your throne amongst the anti-gun advocates of the country, and expect us to take another unearned kick in the face. I hate to say it, but stay in your lane, Doctor.